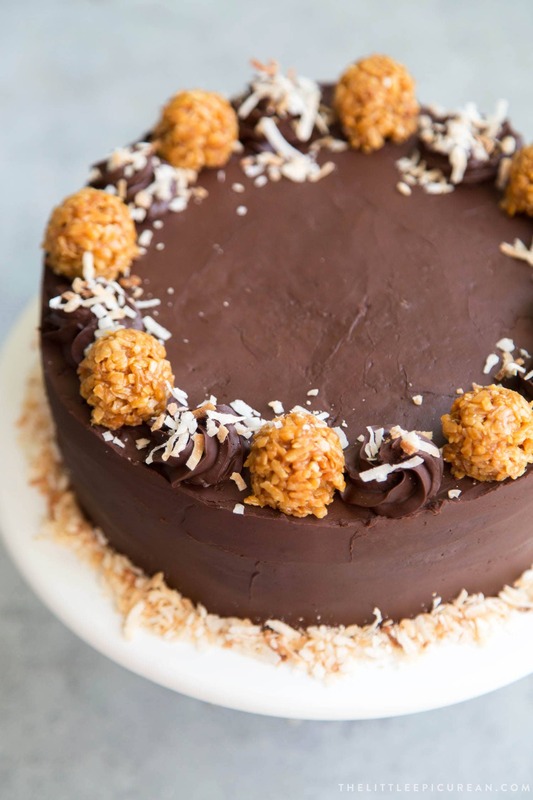 This chocolate caramel coconut cake is comprised of two coconut cake layers with a shredded coconut caramel filling. The cake is finished with both chocolate buttercream and chocolate ganache. Do you look forward to Girl Scout cookie season? I do! In the past, I’ve made homemade Thin Mints and homemade Samoa Cookies. This year I’m converting my favorite Girl Scout cookie into a layer cake! Here’s an ode to my favorite Girl Scout cookie: the Samoa Cookie (also known as Caramel deLites in some parts of the country). I made a cake version using the various components of a Samoa Cookie. 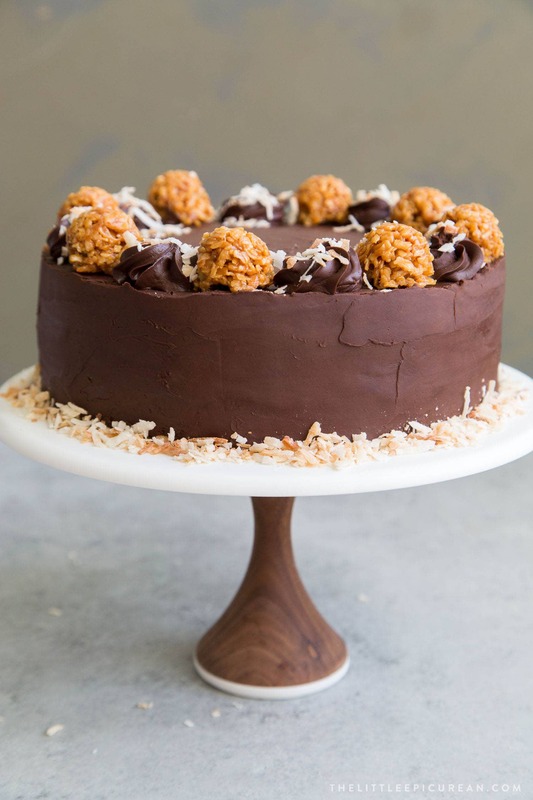 I could call it a Samoa Cake or a Caramel deLite Cake. 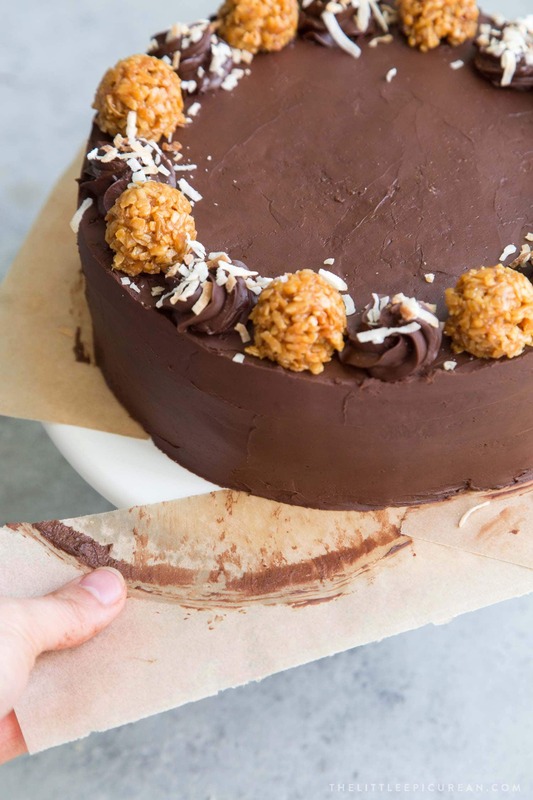 But for simplicity’s sake, let’s call this the Chocolate Caramel Coconut Cake. 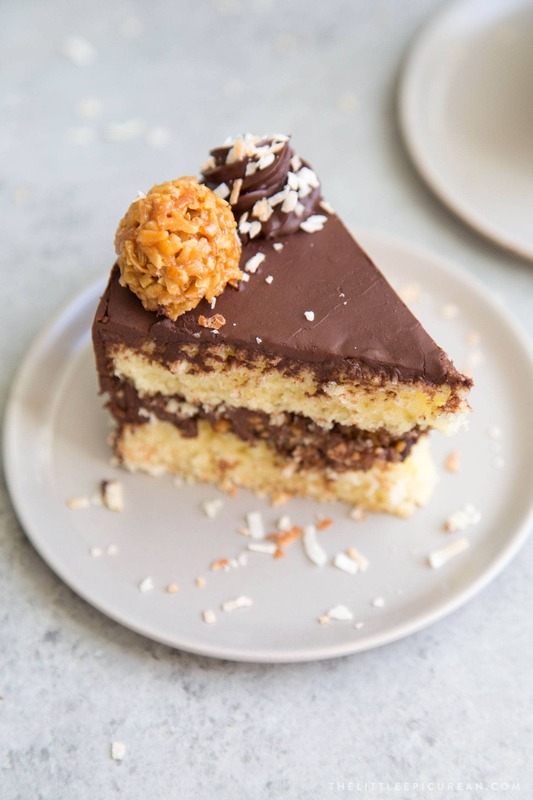 As the name of the cake implies, this dessert is made up of chocolate, caramel, and coconut. The coconut cake layers are made with virgin coconut oil (unrefined version), coconut milk, and unsweetened shredded coconut. That’s coconut flavor three ways. Unrefined coconut oil has the fragrant aroma and rich taste of fresh coconut. As opposed to refined coconut oil (like the one I used in this cinnamon swirl bread recipe) which is generally flavorless. I tested this recipe several times using the 365 Everyday Value Organic Coconut Milk from Whole Foods. It’s great for desserts and baking. I have yet to try this coconut milk for savory foods. Make sure to use UNSWEETENED shredded coconut for the cake batter. Otherwise you will end up with a absurdly sweet cake. I recommend this shredded coconut from Bob’s Red Mill. The filling is made from sugar, butter, heavy cream, and toasted sweetened coconut flakes. Toasting the sweetened coconut is essential! It’s the same recipe I used to top these homemade Samoa Cookies. This cake includes both chocolate buttercream and chocolate ganache. The American buttercream is a simple mixture of softened butter, confectioners’ sugar, unsweetened cocoa powder, and heavy cream. Chocolate ganache is made from melting chopped chocolate in a bath of simmering heavy cream. The mixture starts off runny and viscous. Overtime, as the ganache cools, it will thicken to an American buttercream consistency. Allow the baked coconut layers to cool to temperature before assembly. Spread a thin layer of chocolate ganache over one cake layer. Pipe a double ring of chocolate buttercream along the perimeter of cake. This will serve as a barrier to keep the filling intact. The caramel coconut filling will be quite flexible and pliable. Use your fingers to arrange the caramel coconut filling within the buttercream border. Spread additional chocolate buttercream over the filling. This will ensure the second cake layer will stick. Finally, spread the remaining chocolate buttercream around the exterior of the assembled cake. Place the cake in the fridge for 15 minutes to set the buttercream. Once chilled, spread the thickened chocolate ganache all over. Place parchment strips on the bottom on the cake before decorating. This will protect your cake stand or serving plate from frosting and buttercream. Do not remove the parchment strips until the cake is assembled and chilled. Once you’re ready to serve, gently pull out the parchment. You’ll end up with clean edges and a clean plate! Generally, a 6-inch cake is supposed to be sliced into 8-10 servings. For an event such as a wedding, the slices are cut even smaller so a 6-inch cake could serve 12. 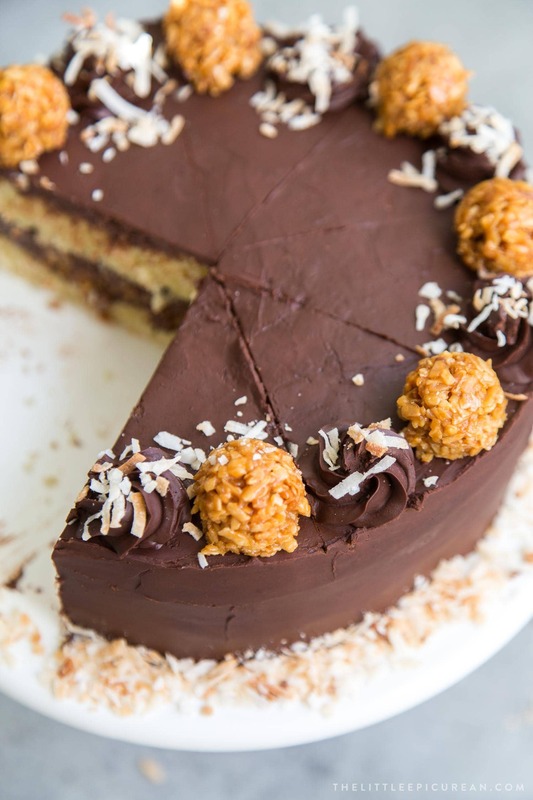 This chocolate caramel coconut cake is a two-layer 8-inch cake. It is very rich and heavy. While I scored the top of the cake to serve 8 slices, ideally, you’d want to slice this into 16 portions. I used the decorations on top of the cake to help create even portions. For this example, each slice gets one chocolate rosette and one caramel coconut scoop (using this small cookie scoop). The assembled cake is best eaten the same day it is built. This cake does not survive well in the fridge for extended storage. The coconut filling will harden. You’ll want to eat this right away! Preheat oven to 350 degrees F. Line two 8-inch cake pans with parchment paper. Lightly grease with butter. Set aside. In a small bowl, whisk together melted butter, olive oil, and coconut milk. Set aside. In the bowl of a stand mixer fitted with a paddle attachment, beat eggs and sugar until mixture is pale in color and slightly thickened. Scrape down the bowl as necessary to ensure thorough mixing. Alternate adding the flour mixture and wet mixture, beginning and ending with the flour. Mix on low speed until combined. Fold in dried coconut. Divide batter between prepared cake pans. Level batter using a spoon or mini offset spatula. Bake for 28-30 minutes until cakes are golden brown and toothpick inserted in center of cake comes out clean. Let cool in pan for 5-10 minutes before unmolding. Allow to cool to room temperature on wire rack. Place chopped chocolate in a large bowl. Bring heavy cream to a simmer. Pour hot cream over chopped chocolate and cover bowl with plastic wrap. Let sit for 2 minutes. Remove plastic wrap and stir ganache until homogenous. Cover with plastic wrap, allowing plastic wrap to touch chocolate to prevent condensation. Every 30 minutes, stir ganache until it has thickened to frosting consistency (about 2 hours). Keep at room temperature. Preheat oven to 325 degrees F. Line sheet tray with parchment paper. Spread coconut into a thin and even layer on prepared sheet tray. Bake for 10 minutes. Rotate pan and stir coconut. Continue to bake at 5 minute intervals, rotating the pan and stirring the coconut until golden in color. Once toasted, let cool to room temperature. In a medium sauce pan, add sugar. Cook over medium high heat until sugar begins to melt. Once sugar begins in liquefy, reduce heat to medium or medium-low. Do not over agitate the sugar, but swirl the pan once in a while to make sure sugar melts evenly. Continue to melt the sugar until liquid is amber brown and aromatic. Add butter to sauce pan. Whisk until all the butter has melted. Remove sauce pan from heat and slowly add the heavy cream. Continue to whisk until cream and sugar mixture are homogeneous. Be careful, once you add the cream, the sugar mixture will bubble and rise quite a bit. Be sure the sauce pan is away from heat before you add the cream. Continue to whisk until caramel is thick and smooth. Let cool until slightly warm to the touch. Then add the salt and toasted coconut. Fold into the coconut until thoroughly distributed. In the bowl of a stand mixer fitted with a paddle attachment (or using an electric hand mixer), cream together butter. Add confectioners' sugar, cocoa powder, cream, and salt. Mix until buttercream is smooth. Add additional cream if buttercream is too thick. Add one tablespoon at a time until desired consistency is achieved. Level cake layers as needed. Place one cake layer on cake stand or serving plate. Spread a thin layer of chocolate ganache over cake. Place chocolate buttercream in a piping bag fitted with a small round tip. Pipe a double wall border along the perimeter of cake. Double wall means pipe two rings wide, followed with a second layer of rings wide. Divide caramel coconut filling half. Use half to fill cake and other cake to decorate. Use your fingers to place caramel coconut filling within the buttercream border. 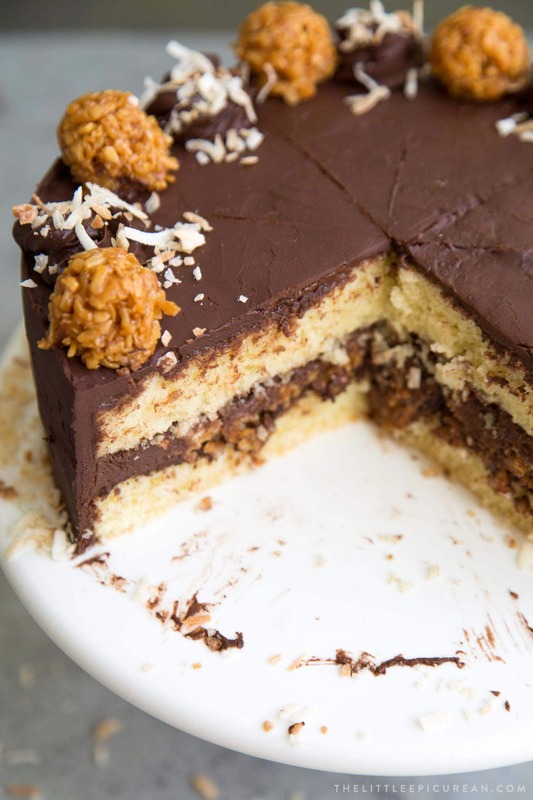 Spread a thin layer of chocolate buttercream over caramel coconut filling. Place second cake layer on top. 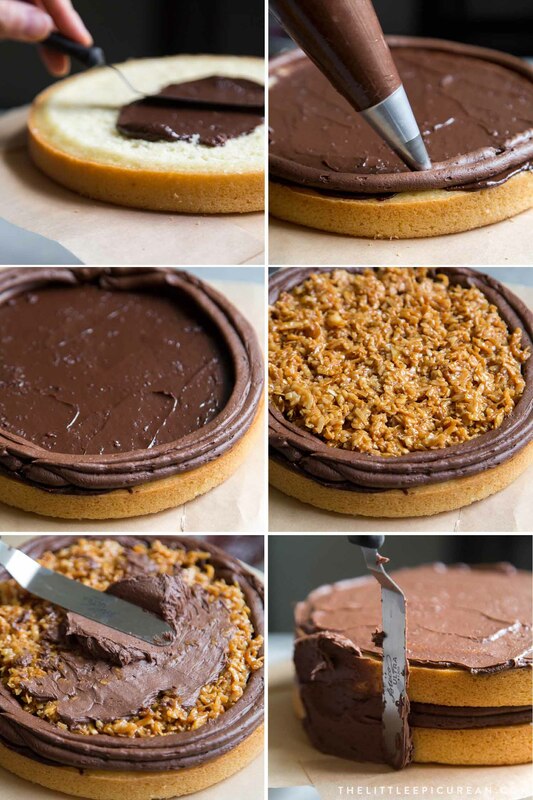 Spread remaining chocolate buttercream around the cake to create a "crumb coat" layer to seal in any crumbs. Chill cake for 15 minutes to set buttercream. Generously coat the chilled cake with thickened chocolate ganache. Because the cake is cold, the ganache will harden and set fairly quickly. Use any remaining chocolate ganache to decorate the cake. Place ganache in a piping bag fitted with a small star tip to pipe rosettes. Use a small cookie scoop to portion remaining caramel coconut filling. Eat and enjoy immediately! Use virgin unrefined coconut oil for more coconut flavor. Refined coconut oil is flavorless. I recommend this coconut milk for this recipe. Be careful when toasting the sweetened coconut. It burn and toast very fast. For cocoa powder, both Dutch-processed or regular cocoa powder will work. I used up every last bit of chocolate buttercream and chocolate ganache to assemble this cake. If you are a heavy froster, I suggest making a double batch of each. Cake can be baked two days in advance. However, the assembled cake should be enjoyed immediately. The caramel coconut filling will not survive well in the fridge for extended storage. The filling will harden. Leftover cake can be stored in an airtight container overnight at room temperature.